Led by artist Anthony Ratcliffe, these one day printmaking workshops will give participants the opportunity to learn how to make a woodcut and produce a mounted print to take home – ideal for beginners and those with some experience. 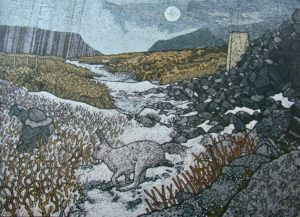 Anthony is now a full time printmaker after many years lecturing at Manchester School of Art, and is a member of Manchester Academy of Fine Arts, and Leeds Fine Artists. He has prints in many public and private collections including The British Council, the Parliamentary Art Collection, Manchester Airport PLC, Manchester Royal Infirmary and MMU Special Collections. To book a place on one of the workshops, please contact Tina Ball (tina.ball@knowsley.gov.uk, 0151 443 4936).